Posterous.com Founder Sachin Agarwal was recently interviewed and when describing his service he likened it to one for Lifestreaming. Below is an excerpt from the interview. Jim: What do you call your site…a blog? Microblog? Microsite? Most closely, yes we are a blog. However, we want to move away from that term. “Blogging” scares people. It’s always meant long text posts, not rich media. Too many people have set up blogs and abandoned them, to want to try another one. Recently people have been using “life streaming” which was coined by Steve Rubel. It seems pretty accurate. This is my life, in photos and video and text, on my website. 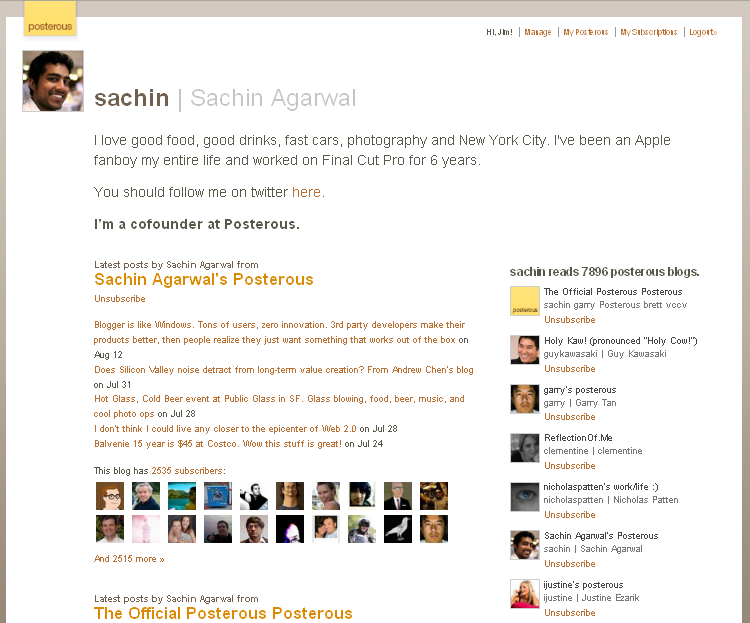 via Posterous – Interview with Founder Sachin Agarwal on connectsocialmedia.com. I'm not sure I'd really call it a lifestream. Where's the aggregation? Posterous is really a publishing platform first and foremost. I have just recently started playing with Posterous and for the most part I agree that it truly isn't what I would call a Lifestreaming service. Mainly because it doesn't offer the ability to import and aggregate external services. That being said, it is a pretty powerful workflow/cross-posting platform that could be use as the engine to push content to the services that make up your Lifestream and in turn host that information on your Posterous site. The service is impressive but is having a bit of a challenge distinguishing itself from the likes of Tumblr, FriendFeed, Twitter and related services but I like it so far and look forward to watching it evolve. Totally agreed on the cross-posting functionality: I think it's even better than ping.fm. And the developers push new features all the time. I'm extremely impressed. It's so easy my mother could use it.